Not that I think plain dark chocolate has any need to be improved upon but every once in a while I like to make these chocolate treats for my boys. 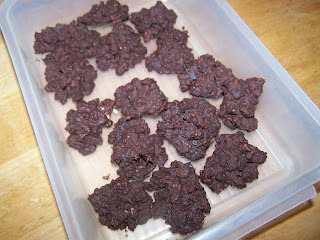 They are quick and easy and chock-full of good stuff. All I do is melt some of the Rancho Vignola dark chocolate chips that I have stored in the freezer and then add whatever fruits and nuts we like. 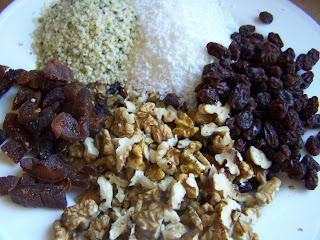 This time I added our homegrown walnuts, some coconut and Rancho Vignola raisins, dried apricots and hemp seeds. I mix the fruit and nuts into the melted chocolate and then drop the mixture by spoonfuls onto a lightly oiled cookie sheet. Put them into the freezer for a bit to set and then they are ready. OMG -- those look yummy! Cruel punishment for those of us who can't have any!! What a delicious idea! I would obviously omit the almonds but everything else sounds yummy! Not cruel punishment, Rebecca. 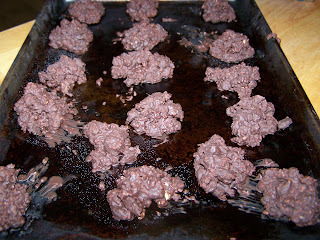 You too can have them, I even included how I make them (read a recipe of sorts) just for you.